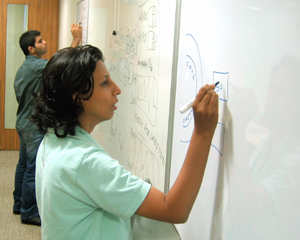 Over 4000 + participants have attended Design Incubator's UX and Usability Trainings since 2005. Read what professionals across different roles have to say about our training. "The information and dimensions presented in this course made me see and think about the underlying design in everything. This course made me a "design sniffer"
“Personally, I thank Design Incubator for enlightening me at a point when I was thinking of quitting the design field. "The course challenged me to think again on what I already knew and helped me learn what I didn't." "We hardly find training in 'User Centered Design Process'. Most training focus on implementation. Design Incubator's training focuses on the complete process before implementation and before starting production"
"The experience of attending this training makes you feel that you have saved a few years of learning effort! ...The structured disciplined approach to UI Design is a much better way to doing it." "This is my first ever training in User Experience Design and it has helped me understand Information Architecture and the User Experience Design Process. 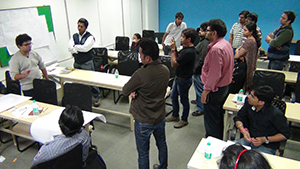 It will help in my decision making to improve the user’s experience…The trainer (Atul Joshi) was mind blowing! He covered as many concepts as possible in a short period of time." 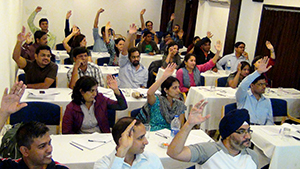 "The trainer (Atul Joshi) is informative, interactive and grabs attention of the class... It helped me revise a whole lot of information. I would like to attend all the remaining courses"
"The instructor (Atul Joshi) has a 'bhandar' of knowledge and experience. He also shares it in a very effective, friendly way." "I like the way the course has been presented and the elaborate content provides a better understanding of the concepts in design. The case studies and examples also helped in understanding concepts effectively… Good job done!!" "Learnt how to follow a robust process for UI Design and UI Architecture. I also learnt step by step approach for visualizing user interfaces…The trainer (Atul Joshi) was amazing and out of the box! I would like to learn more from him." "I liked the depth of UX Design knowledge and the live examples relate to our everyday work... Awesome!... Study material is good"
"A very good course for anyone taking usability seriously"
"This course is really fantastic! ...I got very good ideas from the training"
"I got a lot of information on the flow of design from scratch to the final product. This will really help in my work... It is a very good experience and every designer should attend this course to add value to his / her work"
"I like the workshop because of the content and the way it covers all the concepts in UXD in a short time... It's a very helpful and impressive workshop." 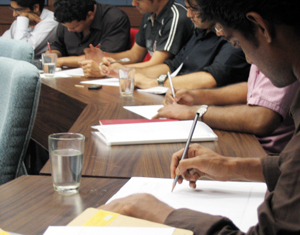 Enthusiastic participation during a class. The course is highly interactive and engaging. Challenging exercises in the training encourages independent thinking and application. 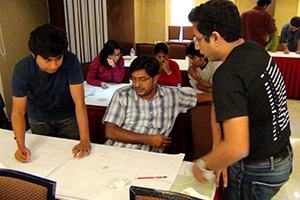 Exercises focus on analytical skills and design methods. Design is not just about tools and visuals, it's about analytical skills and user centred process. 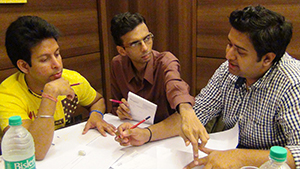 Participants build a prototype during a group exercise. 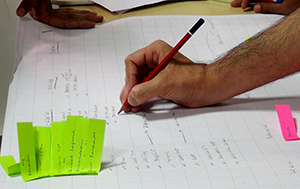 Group exercises reinforce design as a team effort and creativity as a structured activity. Instructor (Atul Joshi) monitors and provides personal attention. He creates a questioning and approachable environment in the class. Participants share their ideas with the class and discuss. Presentations and discussion help improve vocabulary and reinforce concepts. 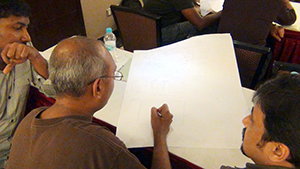 "The training had lots of examples to quantify design concepts... An engaging and excellent way to open your eyes to what your software products are lacking, and how they can be improved"
"The trainer (Atul Joshi) is 'Excellent!'... The training is presented well and covers a vast range of topics... This training is better than other usability training I have attended in the past... Must attend." "I have attended ***'s advanced training course (competitor's training course) in the past. I found Design Incubator's training more free flowing and interesting." "I am extremely happy with this course!... Previously, I did not concentrate my efforts much on the structural and strategic aspects of design. Now, I shall definitely try to implement and utilize this knowledge"
"Great topics, engaging, informative. 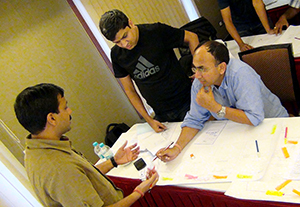 real-time scenarios, good case studies, concise and comprehensive presentation...Instructor (Atul Joshi) engaged the participants with sleek presentation and elaborate explanations." "I liked the method of teaching and engaging the participants… The instructor (Atul Joshi) is extremely experienced, knowledgeable and confident." "...There was extensive research behind every concept that was taught....It was a wonderful experience and I got to learn a lot many things..."
"This course is really advisable for all UI Designers working on software / web application projects and product development"
"The training session helped me in understanding how to apply UX concepts to real world problems... Course is very well structured"
Group exercises encourage discussion and team work. Managers get to understand and experience design roadblocks faced by team members during projects. Managers work with peers from different companies. Discussion and sharing enhances learning. Managers get first hand experience of design methods. They get to understand the priority of design activities and their impact on effort. "The trainer is very helpful and interactive.... A good training and a must go for every professional designer and product developer." "The course is very insightful. A lot of terms in UXD got demystified. Encouraged us as an organization to pursue / adopt a more process oriented approach towards UX." "Loads of concepts and theories are covered. 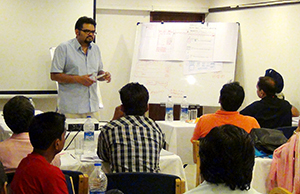 This clears out how a fundamental process of User Experience Design should be… The trainer is knowledgeable and made the presentation very interesting…"
"This training addressed my fundamental doubts in UXD. It is a well structured course and very easy to relate to... Need to attend this training once to get the right understanding of UX"
"The trainer is 'Excellent!'... The examples help to understand the concepts better"
"Trainer (Atul Joshi) has amazing depth of knowledge. Training has really good examples." "Atul Joshi is a great trainer. He keeps the audience enganged and gives good examples." "This course is a wholesome formal brush up on the User Experience Design practice, with good examples and case studies." 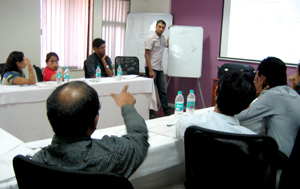 "The instructor (Atul Joshi) has a sound knowledge about the subjects discussed in the training. The examples that he shared were amazing and clarified the concept"
"The training was systematic, informative and cleared all my fundamental concepts… The trainer was cool and interactive." "It helped me realize that there is a lot more to design than what we hear/know"
Practice Heads get first hand experience of how design processes and design teams can be utilized to optimize product development effort. 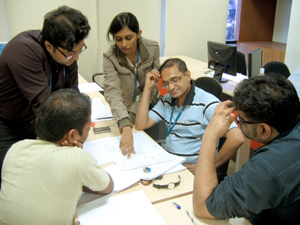 Practice Heads get practical experience of design management and can interact with expert trainers to resolve their queries in real time. Training provides a safe and neutral venue for teams to resolve their differences under the guidance of an expert. "This training has a good structure. It helps to change your perspective. Lots of practical exercises and real world examples make it rich." "The course is a good mix of theory and practicals. The instructor is knowledgable and gives very good industry examples." 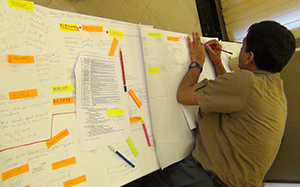 " I love the sincere effort taken by Design Incubator to improve the quality of UX in India. This training is very focused and has the potential of making its partcipants do excellent UX work... 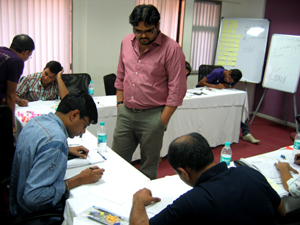 The way Atul Joshi (trainer) teaches the subject makes it easy to understand and remember." "It is a great way to learn how to define your user interface design process"
"It is a good and comprehensive insight into UXD. It is well defined, well documented and extremely informative... It is a must for anyone who wants to understand the field of Interaction Design"
"I liked the sessions on structural design (Information Architecture & Interaction Design). The trainer connected with the audience very well and is superb at explaining." "The course had good subject matter and content, was well explained and presented… The trainer is execellent." "An insightful session... Very helpful... I am going to ask my colleagues to definitely attend this session"
"The training is a good learning experience about all the User Experience Design concepts and processes…The trainer is great." "The training is packed with information and the challenging case studies made me think about the vastness of User Experience Design… Basically an eye opener!!" 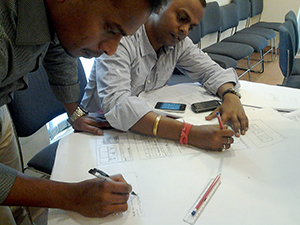 Training helps Business Heads appreciate the user centered design process. Educates them on how it can elevate end user experience and make it a key business differentiator. The training environment brings Business Heads, Managers and Teams on the same platform and conditions them to think of users first. It facilitates in building new processes - better understanding at the top enables quick changes, better alignment at the bottom reduces resistance. Business Heads get first hand experience of how design processes rapidly lead to scalable user centered ideas. 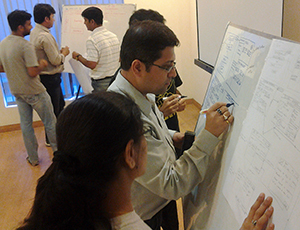 * Above feedbacks are personal opinions of individuals who have attended Design Incubator's training. Photographs are of various training sessions between 2005 to 2014.